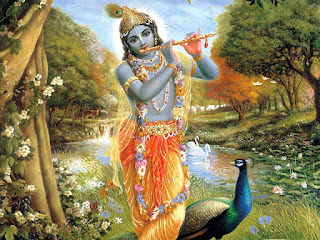 Lord Sri Krishna is the eighth incarnation (Avatar) of Lord Vishnu,when mother earth was unable to bear the sins and burden committed by the evil kings and rulers.Then Lord Brahma,the creator appealed Lord Vishnu to help .Lord Vishnu assured him that he would soon be born on earth to eliminate all the evil forces. Lord sri Krishna was the eighth child of Devaki and Vasudeva in a prison cell.He was then grown in Gokula by Vasudeva friend Nanda and yashoda.After he grown up he Killed the evil King Kamsa and freed his parents Devaki and Vasudeva from the prison and became King and ruled Mathura city. In Mahabharata Lord Sri Krishna played a major role in the victory of Pandavas against kauravas.During the war against kauravas Lord Sri Krishna delivers Bhagavad Gita(The song of the celestial one),which inspires Arjuna and think that it was right to fight against his kinsmen since they were unrighteous. Lord Srikrishna also stated that yoga and devotion that will lead to oneness with God. Chant when in trouble and the lord is with you to solve all your sorrows and obstacles on your way. You can also chant Lord Krishna Mantras , Damodarastakam , Madhurashtakam , so as to please lord to turn away all the difficulties from you and lead a peacefull life.